No, not that kind. I was just observing the shower room at the glitzy-as-hell Airbnb building. 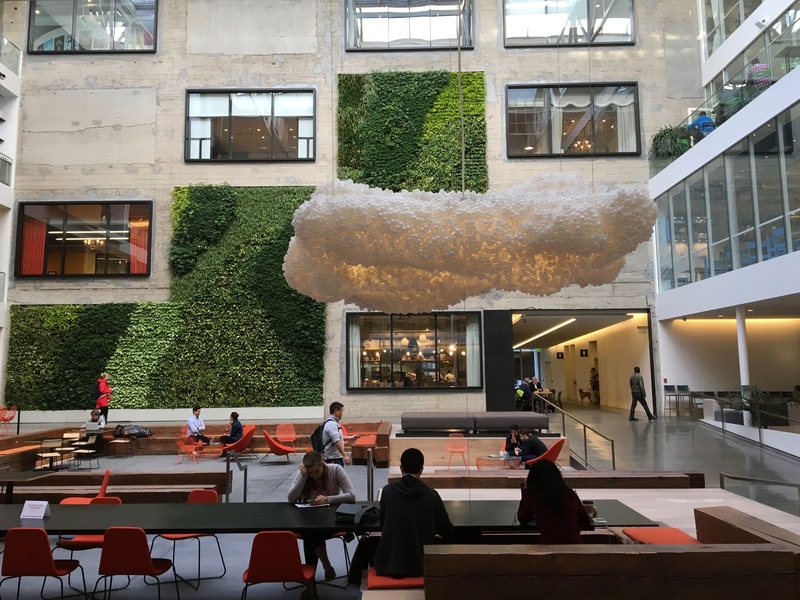 I’m still working for Hipmunk, but we moved into a nook in the Airbnb building, 888 Brannan a couple of months ago. It’s got a lovely courtyard, and the space that Airbnb inhabits is probably also quite gorgeous. I suspect that giant fluffy white piece of art is ‘The Cloud’. 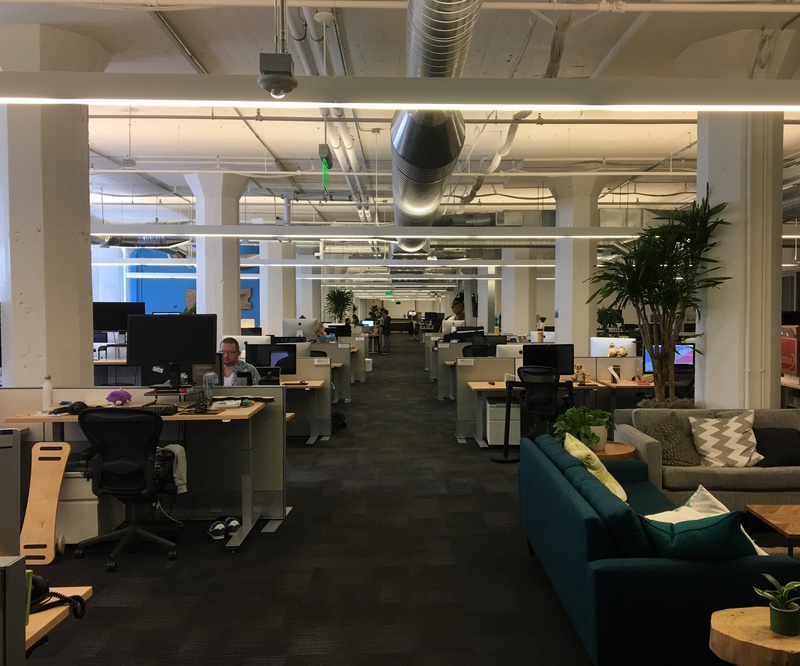 The office that we share with Tripit is unglamorous, and the HVAC is ridiculously noisy during the day, and hilariously so after 6: there’s a spot where it literally sounds like someone is vacuuming the floor, with a very loud vacuum. And the floor is very uneven, in places enough that I have tripped on it. But it’s certainly better than our old spot, where the floor and ceiling were flat concrete and everything echoed. A little carpeting goes a very long way. Creating a dedicated shower/locker room, with three showers, plenty for a building this size. Leaving room for only a total of 26 lockers, probably a factor of five fewer than necessary for a building this size. This forces building management to disallow anyone leaving anything in lockers overnight, which in turn means that nobody uses the lockers for anything, more or less. I note that part of the broad, sweeping entryway that has literally no purpose except to be broad and sweeping could have been shaved down by about 4 feet and it would have given plenty of room for plenty of lockers in both restrooms. Having there be no place to hang towels except inside lockers, where they do not dry. Deciding that a shower room should not leak humid air into the bathroom that it opens onto, and thus putting a door that seals fairly tightly when closed. Neglecting to include an input air vent that is even close to big enough to keep up with the vent fan. Having little changing nooks outside each shower. Great! With no shelf, seat, or anything else to put your clothes to change into. Not great! And with a shower curtain on the outside of the nook, but no shower curtain between the nook and the shower, just a tiny little 1/2″ tall lip on the bottom of the shower. So half of the water from the shower sprays out into the nook and onto the floor. The upshot of all of this is that the floor of the shower room always has a lake on it, and often the room is about half lake. And there’s nowhere to leave your work shoes or even your shampoo overnight. And the entire room whistles. All. the. time. This is what happens when a company wants to look like they’re Apple, but does not have any of Apple’s attention to detail: you have a really nice-looking product that is excruciating to actually use.